I always get quite excited when I’m contacted by a company and it’s usually to ask if I will review their latest products on the blog, to me it’s a huge privilege and an unexpected perk although I’m also not that naïve to not realise it’s a good way of getting very cheap advertising. So when the latest e-mail pinged into my inbox I was intrigued when I saw it was from Pondip, a company I had been aware of for some time, originally they ran a subscription service where you signed up and every month you would be sent a box containing loads of terminal tackle for either carp or general coarse fishing depending on your preference. Each box would contain things like split shot, hooks, feeders, floats, float adaptors and hair rigs for the coarse version and stringer needles, float stops, surface controllers, carp magazines, imitation baits and hooks in the carp version. The trouble with any type of selection box is that there’s always some element that somebody doesn’t like or in this case need, think toffees in a box of chocolates or the coffee ones in a bag of Revels! 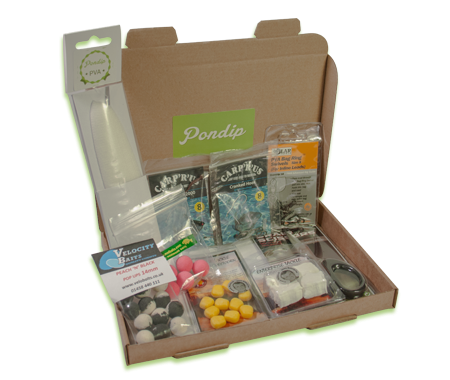 After Pondip got in touch, I had a look at their website and they have now moved away from the monthly selection box and now have an online shop which has some great deals on tackle, bait and clothing. So more exciting times for this blog and look out for my first Pondip article coming very soon. Nice one Jamie; well deserved. Thank you Russell, did you see I'd rocketed up the bloggers challenge leader board with my 4lb chub? Just seen. Bonus points for biggest Stillwater chub too! You should add the other fish you've caught. You can best guess the weights if you didn't weigh them individually. Most people have with modest fish.